In some Southern countries there are national traditions of lace making without rests. Lace makers sit on a carpet or a mate. Lace makers of European school plate sitting on a chair. On this reason a pillow with pricked pattern is to be lifted at 24-36 inches (60-90 cm) above a floor. A table or a special rest is needed to fix a pillow at the mentioned level. 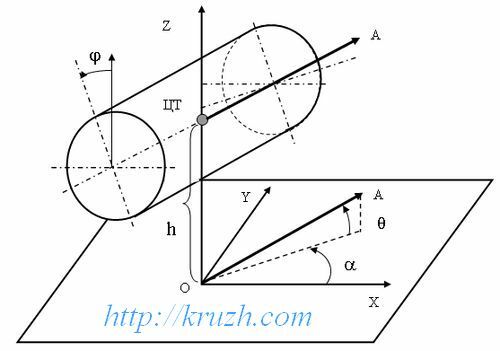 Due to a rest the bolster takes some position in the Cartesian coordinate system XYZ. Let us suppose that Cartesian axes OX and OY are on the horizontal plane and placed along the axes of the bolster symmetry; the axe OZ goes through the centre of its gravity (Fig.2.1). heel ? – an angle of the bolster turning around its longitudinal axe. heel turning on ± 45 grades. These are conditions of coupling lace making. hard bolster fixation when lace is being plated. rests with the ball hinge. These groups are listed here in the order of their historical evolution. The first group rests are the most ancient ones and are being used up today. The rests with the inclined platform are known since the 19th century in Germany. The rests with the ball hinge are used by russian lace makers in Vyatka since the second half of the 20th century.